Sometimes we ignore new words because they seem silly or unimportant mixes or modifications of existing words. But webside manner is not one of those cases. In its way, it is just as important as bedside manner in securing open, honest communication between patient and healthcare professional, and thus in securing a positive patient health outcome, both in terms of the objective health of the patient and their perceptions of the care they receive. Whatever the medium used, provider-patient communication is a critical factor. This is even truer today in telehealth settings where people are still getting accustomed to a new way of speaking to and interacting with their healthcare professionals. Patient satisfaction surveys since 1990 all indicate that the effectiveness of communication is a critical component to how a patient views their care, no matter the result in purely physical terms. These surveys are frequently cited in efforts to improve care, whether at a small clinic or the largest hospital. Incorporating their findings regarding telehealth communications is a necessity as offerings and opportunities to use it expand. Thus, webside manner matters. The basics of how to have a positive webside manner are similar to the best practices for bedside manner. The critical difference is in making sure to understand non-verbal communication as expressed via video links. This takes practice, as with any skill, but it can be mastered with effort. 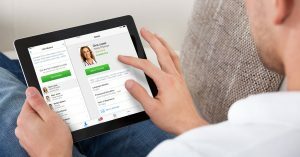 A major point in this type of interaction is that with telehealth, there may not be anything analogous to the “doorknob moment” where a patient makes a comment or asks a question just as the provider is leaving the room. Closing a telehealth connection, without preparation by the healthcare professional, has the same finality of hanging up a phone or turning off a television. But it does not have to be that way. There are known, tested, and successful strategies for getting this sort of last minute question or comment from a patient before ending a telehealth consultation. 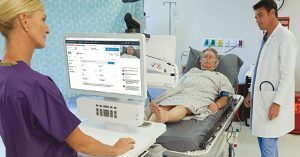 With so many years of telehealth in the field, a consensus has even been reached on how best to do it. If done well, these techniques can even improve the rate of “doorknob moments” among patients who would otherwise let their health practitioners just walk out the door or close the connection, saying nothing at all. 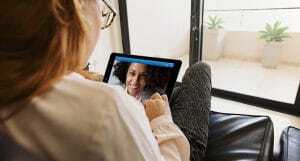 With the quasi-return to the house call that telehealth makes possible, people have been shown to be more communicative and generally willing to talk to their healthcare providers as fellow human beings invited into their homes rather than as strangers in an unaccustomed setting. The long and the short of it is that what patients think about their healthcare matters. Being able to talk to patients in an open, honest manner is an absolute necessity, no matter if the consultation is face-to-face or online. Paying attention to webside manner with as much diligence as bedside manner is the key to it. Telehealth provides the tools. You have to make it work.